Scott was guest on a recent episode of the Duct Tape Marketing podcast. Scott, of the aptly name, hellomynameisscott.com, is a walking, talking, grinning example of how to create a strong brand where there is none and then live the brand in every action. He has built a very nice business out of teaching people how to be more approachable and brandable. 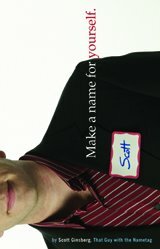 His website is full of great free stuff and I am enjoying the heck out of his new book – Make a Name for Yourself. Every salesperson, business owner, speaker, and generally well adjusted person could benefit from being more approachable. It’s a habit as much as anything and habits take practice.